Hailed by some as the 'eighth wonder of the world', this disused china clay pit is now a thriving global garden. Eden's two 'Biomes' host a plethora of plants and the world's largest indoor rainforest, set amongst more than 20 acres of landscaped gardens. There's an undercover ice rink (seasonal), adrenaline activities for thrill-seekers, and even a youth hostel/campsite if you can't bear to leave! 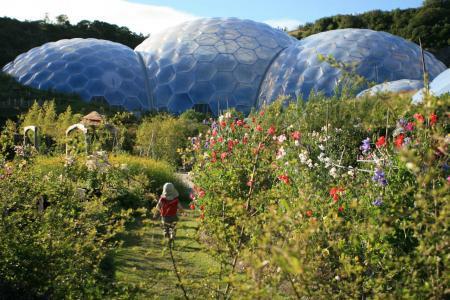 Katie Dicker visited the Eden Project with her children Daniel, 7, and Elizabeth, 4. When you first glimpse Eden's iconic bubble-like biomes, it's hard not to feel a little bit excited. There is something otherworldly about this place – a scene from Star Wars perhaps, a nestling oasis amidst a barren landscape. This is where generations come together to celebrate the diversity of life, to revel at what can be achieved, and to learn about caring for our planet. You could easily spend a whole day at Eden, but pick and choose if you're limited for time (or energy). The Rainforest Biome is an obvious destination (allow at least an hour) and the perfect venue whatever the weather, given its tropical climate. This giant structure, 50-metres tall, is home to over 1,000 different plant species. It can get hot, though, so wear layers and bring a water bottle. There are water fountains throughout the site for refills, and a cooling room in the Biome itself if it gets too sticky! The Mediterranean Biome is arguably quicker, but (if little people allow) you can take your time exploring the landscapes of the Mediterranean, South Africa, California and Western Australia. The air is thick with scent and you could be forgiven for thinking you were somewhere else entirely! The Core was shut for refurbishment on the day of our visit, but is a thriving educational centre and beautifully built (based on the structure of a sunflower). It is home to a stunning giant seed sculpture as well as plenty of hands-on exhibits. From the Visitor Centre at the entrance, twisting paths run around the slopes of the pit to the main attractions at the bottom. All venues are walkable and wheel-friendly with gentle slopes and wide walkways, but there's the option of a free tractor-driven land train (approx 5 minutes, every 20 minutes) – down and up – if legs are tired. The gardens themselves could occupy a couple of hours if the weather is kind. The Visitor Centre has a popular space-themed soft play area where under-fives can let off steam. This is conveniently located by the café, so parents/carers can refresh at the start/end of their visit. The adjacent 'Plant Takeaway' exhibit is also a magnet for children (to avoid any spoilers, think 'what would happen if there were no plants?'). The Core also has a soft-play space (reopening May 2018 with new facilities) and a large outdoor wooden climbing frame popular with clambering hands and feet. On the other side of the gardens, a wooden ship with ropes and rigging is a popular destination for tinies, with seating for resting party members amongst an array of tea bushes. Daily storytelling in the Mediterranean Biome is also good for some downtime. Eden offers a number of children's trails to occupy enquiring minds. You can download some in advance and maps, too. The Rainforest Biome is a spectacle in itself, and children will enjoy spotting the bananas in the treetops, passing the giant waterfall, and discovering a Malaysian house with its own vegetable garden. Older children will enjoy learning more about the plants used for medicines, fuels, materials and food. In the Rainforest Biome, you can find out where welly boots and car tyres come from, and the source of your favourite chocolate. For those with a head for heights, the aerial platform suspended from the roof gives the best views! The Core is also a good destination for interactive exhibits and hands-on learning. Whilst visiting Eden, brave and bold over-eights might enjoy the range of Hangloose Adventure activities situated on site. These can be combined with your visit (or done separately, in which case an Eden ticket is not required). Choose from Skywire (England's longest/fastest zip-wire), Gravity (a giant cliff swing), The-Drop (a free-fall dive), Big-Air (a free-fall jump), K2-Climbing (a huge climbing tower) and Vertigo-360 (a loop swing). Zip-wire from £25, others from £12 (combination tickets are also available). You can book in advance or just turn up on the day. 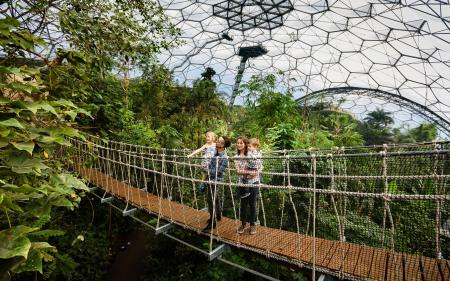 The new Canopy Walkway in the Rainforest Biome gives great views and is wheel-friendly (except the Rope Bridge, stretching 23 metres between the Biome's two tallest trees). The Cloud Bridge gives you a taste of nature's cooling mechanism, and is a magnet for children and children-at-heart! Do also keep an eye out as you walk around the gardens, for zip-wire thrill-seekers crossing the skyline. If Superman came to Eden, he would look something like this! Eden is renowned for its eclectic mix of exhibitions and activities during the school holidays. Previous years have seen interactive dinosaur and solar system exhibitions, magical visits from Santa and his elves, egg-cellent Easter games, the spooky 'Halloweden', and activity weeks based on children's books and films. In autumn and winter, the ice rink is popular. You can book a 40-minute session online or at the rink itself (adults £7, children £6). Penguin skating aids (£4) are available for younger members, and you can also arrange to take a manual wheelchair onto the ice. If it's breakfast, lunch or tea you're after, you're never far from an eatery at Eden. The Eden Kitchen in the Link building (between the Biomes) has seasonal, freshly made dishes, sandwiches, soup, pastries and desserts. Cosy up with other families at long wooden tables and benches. Mains around £9, kids dishes (or lunchboxes) around £5. Hot meals served from 12pm. Alternatively, the Mediterranean Kitchen offers a more intimate restaurant experience (with pizzas, pasta, paella and desserts). Lunch served 12-3pm, mains around £9, kids around £5. Other outlets around the site include a Pasty snack bar, Ice cream parlour, Bar and grill (by the ice rink for burgers, crepes, hot chocolate), the Core Café (with a terrace view of the Biomes in summer) and the Eden coffee house (at the start/end of your trip). If you want to save your pennies for ice creams, there are plenty of grassy spaces and benches to enjoy a homemade picnic in fair weather. Eden is open every day except Christmas Day (and a few January days for maintenance), 9.30-4pm but check online for seasonal hours. Adults (£27.50), Children 5-16 (£14), family of four (£71), children under 5 go free. If you book online you can save 10% and your ticket will be valid for a year (if booked at least one day before you go). Worth considering as it's not a cheap day trip. Membership is also available and for those living in Devon or Cornwall, an annual Local's Pass is an affordable option. Eden is well signposted from the A30 (from Exeter) and the A391/390 (from Plymouth). There is free parking at the top of the site and if you don't want the long walk, a park-and-ride service takes you to the entrance itself. Bear in mind that it can take 20 minutes or so to park up and get the bus down – some of the car parks have toilet facilities (you can seek help from an Eden steward!). The Eden shop is huge and well worth a browse, but if you want (or need) to avoid it, you can exit the Visitor Centre by the café. Children will be drawn to the exhibit-themed gifts and toys, stationery, hair accessories, drums, whistles and other tribal musical instruments. Adults may be distracted by the plants, gardening tools, books, frugi clothing, food and home accessories. An ice cream cabinet at the checkout is handy if you want to entice little legs on the walk back to the car (or back to the bus). Check out Eden's free online science resources, including diagrams on photosynthesis, the nitrogen cycle, pollination and geothermal power. There are also tips on how to build a den, how to save water, and how to live with less plastic, and an online tool to explore your carbon footprint. Learning about plants, ecosystems and environments is part of science lessons in primary school.